Egg Rolls Are BACK On The Menu…Hurrah! I don’t personally know Melanie Scott of Amarillo, TX, but for a few moments during dinner last night, she was my BFF. During these last four years of weight loss and maintenance, I’ve chosen to stop eating several kinds of food including one of my favorites: egg rolls. I always thought egg rolls had to be deep-fat fried, and deep-fat fried anything sits like a lump in my stomach. Despite my love for egg rolls (and funnel cakes, Burger King French fries, and the fish ‘n chips they serve up at a great little basement pub in Niagara-on-the-Lake, Ontario, the name of which escapes me), digesting them would not be worth the pleasure of eating them. I’d made a difficult peace with the fact that I’d never eat egg rolls again and my life went on as usual, albeit a little emptier. Enter Melanie Scott and her recipe for Spinach & Black Bean Egg Rolls in a recent edition of Simple & Delicious, one of my favorite food magazines. 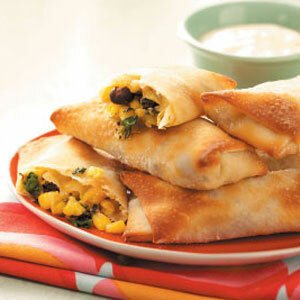 Not only is Melanie’s recipe one for low-fat eggs rolls, but low-fat vegetarian egg rolls. They sounded almost too good to be true. But let me tell you, my friends, they are true and they are good. Very good. In a large bowl, combine everything except the egg roll wrappers. Place ¼ cup mixture in the center of one egg roll wrapper. Fold bottom corner over filling. Fold sides toward center over filling. Moisten remaining corner with water; roll up tightly to seal. Repeat. Place seam side down on a baking sheet coated with cooking spray. Spray tops of egg rolls with cooking spray. Bake at 425 degrees for 10-15 minutes until lightly brown (I flipped them halfway through cooking). Serve warm with salsa and/or light ranch dressing. If using reduced-fat Mexican cheese, each egg roll has 147 calories, 2 grams fat, 26 grams carbs, 2 grams fiber, and 7 grams protein. Using a lower-fat cheese like Cabot or a fat-free cheese, each egg roll is 1 Point; two egg rolls are 3 Points. Now I can have my egg rolls and eat them, too. However, I’m sure I’m behind the times, and several of you will write to me with “I’ve been eating baked egg rolls for 20 years!” to which I say, bring it on! My only stipulation? Include a recipe. This entry was posted in Uncategorized on June 13, 2009 by Lynn Haraldson. Thank you for sharing this recipe! If you don't have the time to make them from scratch…Trader Joe's has vegetarian egg rolls,and Chicken Eggrolls that are delicious and under 140 calories each!! Yum! Those look soooo good! this recipe is adapted from Sam Zein (cooking guy on Discovery Health). we dry fry the coleslaw mix on top the stove in a non stick pan. Mix chicken in to warm though and remove from heat. Place one wrapper on the counter, with a corner pointing at you. Put 1/10th of the filling in the center of the wrapper. Fold the nearest corner of the wrapper up covering the filling. Fold in the two sides and finish by rolling away from you and moisten the very end with a dab of water to help stick. Continue with remaining wrappers. bake at 350 degrees F until lightly brown – about 15 minutes. Serve with extra sauce for dipping. We just found joys of using egg roll wrappers and baking – earlier this spring. Not 9 years ago. We had never used egg roll wrappers prior to this. and like you – had thought they must be fried. We make a cheat/baked crab rangoon much the same way – adapted from 'real' recipes – but using NONfat cream cheese. It doesn't take much cream cheese for each one. Kids love them. My eleven year old makes all these – very fast – we have started doing homemade chinese once a week. The two dishes above plus our version of fried rice – we cook all the parts separately and then measure portions (egg white scrambled eggs, shredded cooked chicken, cooked peas/carrots, brown rice, etc) into each bowl. We use low sodium Teriyaki – the lowest sodium of any sauce that I have been able to find. And I dilute with water to make it go farther (or is it further?). So one T sauce mixed with one T water to make 2T. Yum! This must be egg/spring roll week, because my best friend brought out the roll wrappers and is going to make healthy spring rolls for us this week! LeftyB…how've you been, girl?? Good to see you here! Shelley, I made spring rolls a few months back and served them with a PB2 peanut sauce. Just thinking about them makes my mouth water. I have to dig that recipe out again. Thanks for the reminder. Vickie, I'm going to experiment with fillings, too. I can't find low-sodium teriyaki around Podunkville and I always forget when I'm in P'burgh. I'll have to go online and just find some. Any suggestions? is the only one here. So I don't know that it is the best – it is just the ONE. I went down the sauce aisle and looked at sodium only. This is the lowest that I could find (and I don't consider it low enough – that is why I add 1T water – so it is 320 for 2T, which is still NOT great). Calories are 15 with 3g of sugar. And just this minute I remembered HOT chinese mustard. Very little sodium, lots of flavor if you can stand HOT, and very few calories. I think you're thinking of the Angel Inn in Niagara on the Lake. Next time you're there we'll have lunch! I don't have a recipe, but I like Vickie's. An eggroll is really the only way I'll eat cooked cabbage, so I like that idea. My problem is I need gluten-free egg roll wrappers. I keep hearing about some made with rice flour but can't find them in any store I've ever been in. Thanks, Vickie! I'll try to find the Kikoman and the mustard. Those look delicious and the fillings you put in them are only limited by your imagination. If you like those you might like my baked chimichangs too. I don't want to put a link here but if you want, check out my August 2007 archives for Baked Chimichangs. Lynn – I stopped at the store on my way home last night and made these for dinner! They were delicious–my husband and I really liked them and it made so many that I bought 5 of them to work today to share in my office. Everyone raved about them and wanted the recipe. Thanks for posting the recipe! I hadn't thought about baking eggrolls, but I'm going to try Vickie's chicken and cabbage ones, too.